I heard a rumour a while back about Clothkits relaunching and had a moment of fond nostalgia for my turquoise pinafore dress which I adored when I was about 6. I was prompted to go and have a look at the new stuff by a post on All Things Considered this evening. Oh my. I thought the kids stuff looked good. Then I spotted the words Rob Ryan (who’s work I love) and there was a match made in skirt heaven. A Rob Ryan-designed Clothkits skirt for grown ups. Almost sheer perfection (sheer perfection would be if it was printed on organic cotton). I want to design for Clothkits now. Should we start a campaign? « A good vintage. At last. You could enter the competition on the Clothkits website, and you might end up with your design on a skirt. I think I remember that turquoise pinafore dress – I do believe I was the one who assembled it. So glad you liked it enough to remember it still! 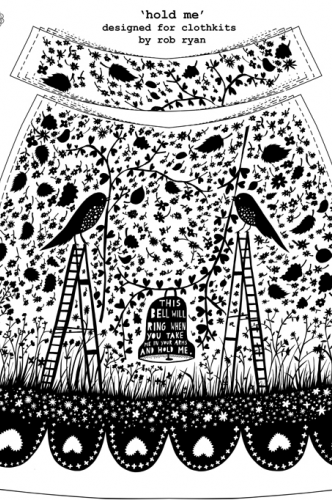 I looooovvve Rob Ryan’s work, I adore that skirt. I’ve never heard of ClothKits, what a find! Thanks!